Hi, I’m Samantha from Tanya Eavenson’s debut novel, Unconditional. Elizabeth Roberts, the main character, is my sister. Okay, this is harder than I thought. Do you ever feel responsible for something even if it wasn’t your fault? A part of me feels that way for Elizabeth’s tendency to run from her problems. I guess you can say it’s what I showed her when I left home at nineteen. See, Elizabeth looked up to me. She tagged along everywhere I went, tried to dress like me, even liked the same music I listened to. But I couldn’t handle Mom and Dad always nagging me to go to church. How I needed better friends or why couldn’t I be more like Elizabeth. I just got tired of it and left. The world was not what I thought it would be like, but I was determined to make it. And I did. But at a price. When I got the news about Mom and Dad’s death, it really hit hard. Not only had I not spoken to them in years, but now Elizabeth avoided any contact with me. I know I deserved it, pushing her away like I had. But by God’s grace, a few years ago she forgave me and let me back into her life. That’s when I met Chris, Elizabeth’s husband, and his brother Phillip, my husband. Yes, Elizabeth and I married brothers. Funny how God works things out. Anyway, what can I say about Chris? He was always so sure of himself and where he was going in life. Nothing was going to stop him. You know, the “everyone knows your name” type. And he was in love with my sister, the total opposite. Quiet—well, unless she was talking about her faith—otherwise quiet, very loving, and extremely beautiful with those eyes of hers. Turquoise I’d call them. Yes, Chris and Elizabeth were complete opposites, yet in a way, perfect for each other. I never thought they’d have marital problem. Chris’s family are church goers, missionaries, deacons, lawyers running a homeless shelter, but I’ve learned that if you’re not living day by day in the presence of the Lord, it doesn’t matter who you are; the devil will find his way in and try to destroy what God has created. I think a lot about what happened between Chris and Elizabeth. I also think a lot about my own life and the past. How God took the bad things that had happened, the ugliness of my sin, and used those circumstances to draw me to Himself. I see this verse being true in my and Chris’s life, even though our stories are different. God lead us into the desert, and that is where we listened. God didn’t give us what we deserved. Instead, He loved us, wrapped us in righteousness, faithfulness, and compassion, giving us hope for our future. Has there been a time in your life the Lord allured you into the desert—a time of loss or uncertainty—and spoke tenderly to you? Compassionately bringing you back to Him? If so, share your story. In your story there is hope and assurance of God’s love for others. Jo Huddleston is a multi-published author of books, articles, and short stories. Her debut novel, That Summer, Book One in the Caney Creek Series has just released. Book 2 in the series is scheduled to release April 2013, and book 3 in the series is scheduled to release September 2013. We live in a college town, which made it convenient for our children to earn college degrees. 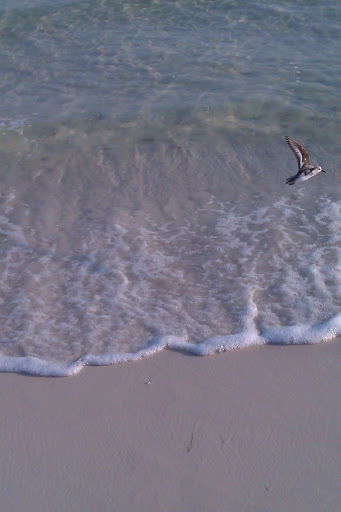 We love living in the South and vacationing on the seashore of the Gulf of Mexico. We lost a fourteen year old cocker spaniel. I won’t get another pet because the pain of loss is too great. What 3 fun or unique things can you tell us about yourself that we don’t know? I chew my ice cream. I fear being in the dark. In high school I played varsity basketball. Being with my children and grandchildren, spending time at the beach, and of course reading. I minored in English in college and reading the literature in classes whetted my appetite for the written word. After that I became a voracious reader. When I retired from working, I sent a few short stories out. When the swift rejections arrived, I decided maybe I needed to know more about writing than just reading it. After reading writing craft books and magazines, the first article was accepted. I was hooked. Three years later my first two books released. I have a corner of a room anchored with a desk, laptop, printer and stacks of papers. In my mind I do. I plot my book in my mind. I choose a title that describes or summarizes that story. None of my titles have been changed by a publisher—yet. Please tell us about That Summer. That Summer is the first book in The Caney Creek Series. The book is an inspirational Southern historical novel set in the Appalachian Mountains of East Tennessee. The Great Depression brings devastation to all , but love’s triangle survives. Can you relate the book cover with your story? That Summer is Book #1 in The Caney Creek Series. The top half of the cover shows a beautiful, peaceful creek that is as important as a character in the entire series. The lower half of the cover has a photo of a snazzy car from the late 1920s. You’ll have to read the book to learn why the car is significant. That Summer is the story of God’s forgiveness so readers will understand that no matter how far they may stray from Him, His forgiveness is available. The book’s message is that God does not abandon His children, but rather they let go of God. The reader will discover that God is always close, waiting on the other side of their heart’s door; waiting for the straying one to love Him and depend on Him. All of my ancestors and I were raised in the East Tennessee Appalachian Mountains area. I listened to their entertaining stories, especially at family reunions, about their times past. As my ancestors began to pass away, I felt that their stories should not be forgotten. That Summer is NOT a true story. It is a story of many stories with a good bit of embellishment from me. Yes. Thank goodness for the internet where I found factual details to include in my book. I began writing in 1990, sold my first article in 1991, and sold my first book at a writers’ conference in 1993. Pray about every step you take on your writing journey. Strengthen that fruit of the Spirit—patience—for you will need it. Writing for publication is many times a waiting time. Be patient and never give up if you believe God has given you the talent to write for his glory. That Summer has just released. I’m writing on book two in the Caney Creek Series. Publisher plans are for book two to release in April 2013 and book three to release in September 2013. Read all you can about the craft of writing. Find a writers’ conference near enough to be affordable for you to attend. Soak in all you can in the workshops and from the speakers, editors, and publishers even at meal times. Be prepared for rejection. They won’t be rejecting you but what you wrote. Margaret Mitchell received over twenty-five rejections for Gone With the Wind! They told her nobody wanted to read about the Civil War. Leave a comment by clicking on the conversation “bubble” at the top of this article, to enter a drawing to win your own copy of That Summer. She bounces unsteadily across the room, sheer delight painted across her plump cheeks, her tender arms outstretched towards yours. She’s never taken a step on her own before and you hold your breath, as if by that one action you can keep her upright. Her eleven-month-old legs stutter and splay, and she goes down hard on the floor. Looking up at you she wails her defeat. A. Turn your back and walk away.She should have gotten it right the first time. Wicked child for wasting your time. You have better things to do than waste your time on such a helpless situation. B.You run to her and dry her tears and tell her to try again. No true mother would ever act out the first scenario. No true father would do anything BUT the second. To God we are all toddlers, faces smeared with jelly, pudgy hands making a sticky mess of everything we touch. He smiles because we tried. A father walked with his young son on the beach. An approaching storm churned the ocean mossy green. The two plowed into the waves, laughing and jumping over them until at last they stood shoulder deep in the briny water. When the next wave came, the father called to his son over the roar. The boy gazed down into the waters, as if to stare at his feet. The boy’s forehead wrinkled in fear. A gray, foaming curl of water closed upon them. The boy wanted to swim with the wave, but he did as the father instructed. He planted both feet, teeth outlined beneath thin lips, and leaned toward the coming wall of water. A sharp slap of saltwater nearly knocked him to his knees, but when the wave had passed over them, the boy emerged. Slinging wet hair and wiping water from his eyes, he turned a freckled face toward the father. The father slipped his hand to the back of the boy to steady him as the froth rolled shoreward. The boy curled pruny fingers into his father’s palm. The father bent and studied his son’s face. 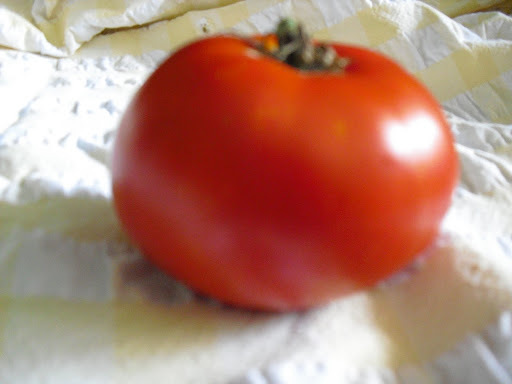 “The perfect tomato!” I held it in my hand and felt it’s plump, juicy roundness. It was still warm after being plucked from my neighbor’s garden. We have a barter system. They give me their excess tomatoes and I bake homemade bread for them. It works. I stand over this little marvel, knife in hand and hesitate. Shame to destroy such perfection, but then again, it’d be a greater shame not to eat it! Tomatoes represent summer to me. I remember my mom’s garden, how she would come in wiping the sweat off her forehead with a dirty gloved hand. In her other hand would be a bowl filled with deep red tomatoes. Her offering of love to us.Plan, till, sow, water, reap. An age-old cycle repeated before my eyes.A sermon in a vegetable.A visible reminder of my Father in Heaven’s love and his commands to us. 4As long as it is day, we must do the work of him who sent me. Night is coming, when no one can work. Plan, till, sow, water, reap. Amen. My dog Brandy is neurotic. She is, really. 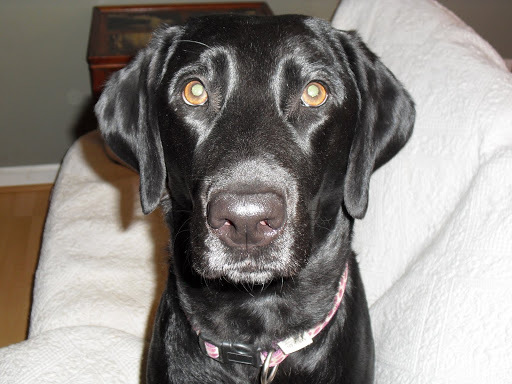 She’s a full-blooded black lab, beautiful with a graceful angular face and liquid brown eyes, but she is an emotional pot-pourri. She’s afraid of: fly swatters, dish towels, plastic bags, umbrellas, and loud sounds. If the noise level in a room gets to be too much for her, she quietly slinks to the hallway or the farthest room she can reach. Her father was a hunting dog, the type that does hunting trials. Go figure.Poor Brandy has been the whipping dog of our other dogs. She just wouldn’t take up for herself. Until the other day. I guess after five years of being put in her place, something snapped. We were throwing a tennis ball in the living room for Charlie, our other dog. Charlie is a Heinz 57 who snarls and bullies her way around Brandy. If there is a tennis ball being thrown, it is without saying, Charlie’s. That day though, we went through the usual scenario. Tennis ball thrown, Charlie lunges. Suddenly from the right corner of my eye I see a blur of black. Brandy’s white teeth flash and the tennis ball is in her mouth! She looked proudly at my husband and I, wagging her body in her “happy dance.” I cheered. Brandy ruled.That showed me there is hope, as long as we breathe, we can choose to change. That was the day I watched an old dog learn a new trick. I’m stopped at a red light. A high school track team jogs past my car, the group is bunched together, each runner jockeying for position. Legs flail and elbows push to get that extra bit of advantage. As the trample of feet pass me, two stragglers come into view. They are a half block behind the others, probably won’t catch up. The closer they get, I can see one is struggling to keep running. Her head is down, like someone pulling a load, like a draft horse. Her chest heaves. The runner behind her tries to pass, no wait. She is not trying to pass. My heart breaks when I see what she is doing. Her hand rests lightly on the back of the struggling runner. She is keeping pace easily, and by that light touch, she is saying, “Go on, you can do it.” The last one is obviously a strong runner. She moves effortlessly.She sacrificed her place in line to strengthen the last, the least. The battle in the supermarket began…Round one, Grapefruit vs. Chocolate chip cookies. Grapefruit won. 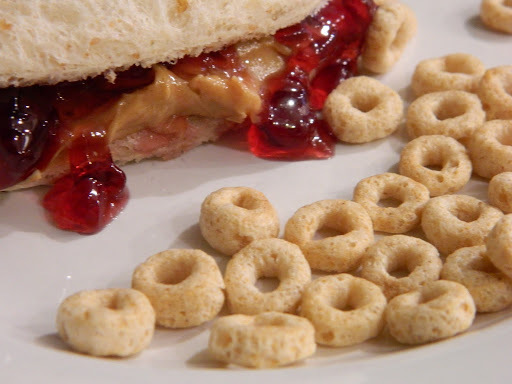 Round two, Kashi cereal vs. Poptarts…Kashi won. Round three, Orange Juice vs. Coke, Orange Juice won! By round four I was feeling cocky, “yeah, bring it on!” I breezed through the bakery department, stopping only to pick up a package of flatbread. Only one more product added to the grocery cart and I was done. Another epic battle, another triumph of the human spirit. By the way, cheese danish is considered a dairy product, isn’t it?